Tryghedsfondens Familiehus is a house designed for families whose children suffer from brain damage. The family house is designed for people going through very difficult periods in their lives. A child's accident affects the entire family, and the family house must therefore meet a wide range of needs. 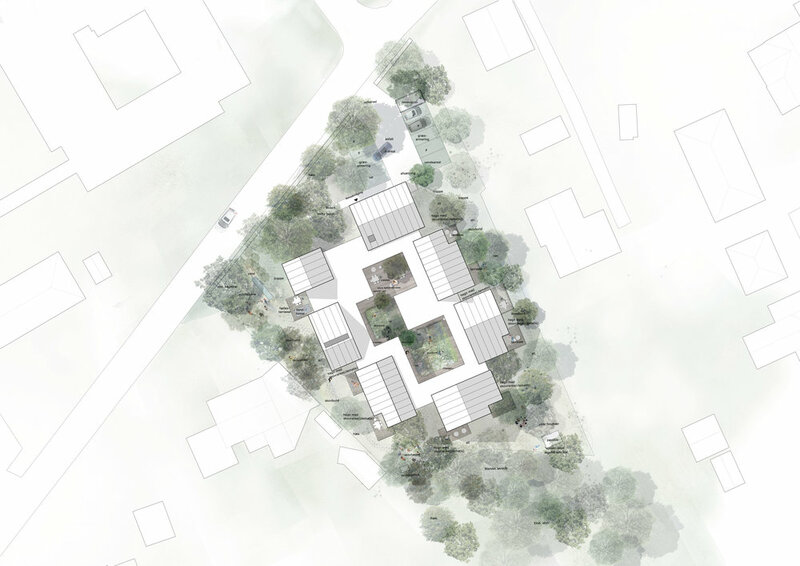 It is our vision to create a beautiful and peaceful house where aesthetics and healing architecture meet – a haven for distressed families who find themselves in an extremely vulnerable position. The development of the project has therefore valued the individual needs of the families and has resulted in 3 concepts consistent with the development of the project: Home, Community and Privacy. The house consists of a series of small houses combined with an internal passage that encloses a courtyard. The family house offers both private living spaces and communal areas such as a kitchen and living rooms. Nature contributes on a large scale to the concept of healing architecture and plays an extensive role in the design of the house. Nature is embraced through the surrounding landscape and the interior courtyard. The courtyard offers spaces designed to host both playful and more secluded outdoor areas. 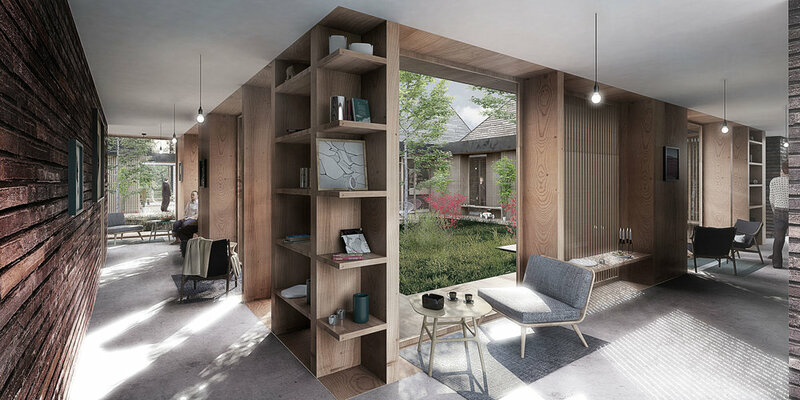 The passage connecting the houses creates seating spaces and niches, inviting people to meet each other on various formal and informal levels. The passage extends in selected places to create the common kitchen and living rooms. 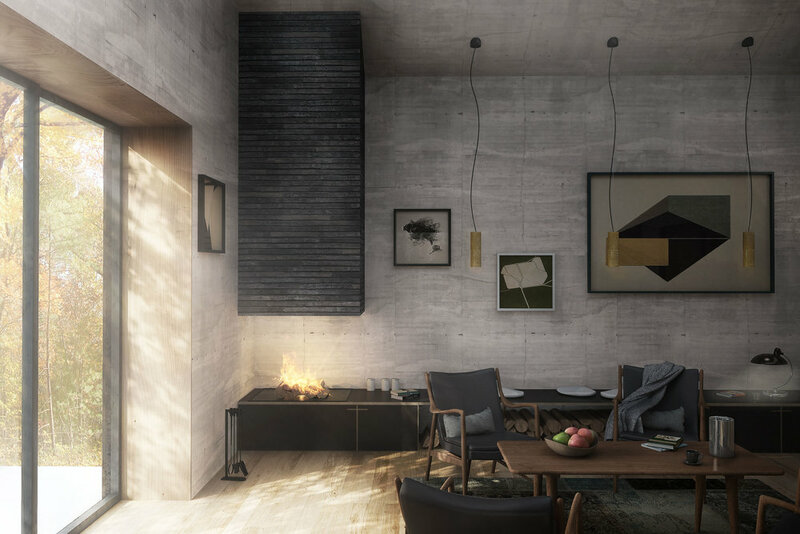 The architecture encourages the community feeling by creating informal living areas, which can be used by several families at once or a single family. There is a combination of more well-defined common spaces and recreational areas to make possible spontaneous meetings between people. Common areas help support the atmosphere created in the encounter and interaction between the volunteers, staff and families. Here, families can come across each other and share their experiences. The community feeling offered in the house is an option and not an obligation. Therefore, we have created a house where each apartment has its own entrance, terrace and lounges. Small houses that close in on themselves create a private housing development, the "cave". The family house offers, apart from communal areas, the possibility to retreat to a private space that meets the needs of every individual.